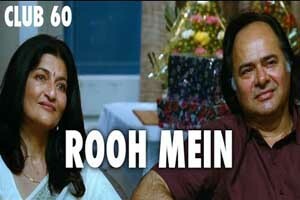 A romantic song sung by Raju Singh featuring Farooq Sheikh, Sarika. Star Cast: Farooq Sheikh, Sarika, Raghuveer Yadav, Satish Shah, Tinu Anand, Sharat Saxena, Vineet Kumar, Suhasini Mulay, Zarina Wahab. The video of this song is available on youtube at the channel T-Series. This video is of 1 minutes 31 seconds duration. Lyrics of "Rooh Me, Kaash Hum Tum Mile Nahi Hote"
Lyrics in Hindi (Unicode) of "रूह में, काश हम तुम मिले नहीं होते"